Circa 1800's, a rare and beautiful baby's bonnet with colorful glass and steel beads on a fine quilting. The workmanship is very good. This is a wonderful item for the collector. Rare circa 1870'a girl's bustle gown. 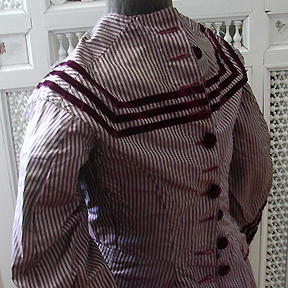 Plum and mauve striped, with bodice, skirt and overskirt with two pockets. Wonderful item for the collector. 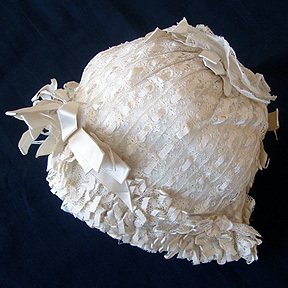 A enchanting whitework Christening bonnet with masses of ribbon work surrounding the outer edges. A lovely frothy concoction. Wondeful for baby or for collector. 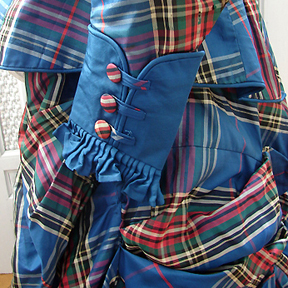 A lovely 19th C. blue and red tartan plaid silk girl's dress with fitted bodice and a festoon buttoned overskirt. 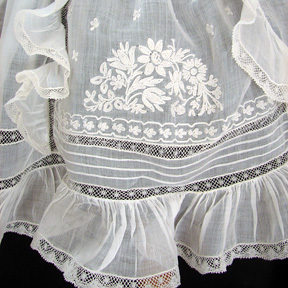 It is extremely rare to find young girl's clothing from the 19th C. A wondeful item for the collector. 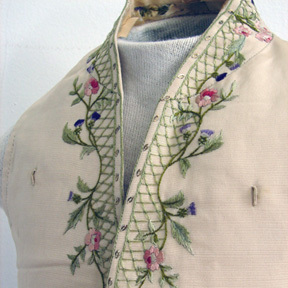 Circa 1890-1900's, a lovely child's embroidered waistcoat with provenance. This was made for "Master Bache Hay" by Meyer and Mortimer, 37 Conduit St. in London. It is quite rare to find a child's waistcoat like this, so an excellent item for the collector. Beautifully hand-stitched with delicate florals and vines against a lattice design. A lovely item! It is always a pleasure to find this highest level of Ayrshire work. This gown is encrusted with the finest Ayrshire whitework, padded stitch embroidery , and fillings abound in the opulent skirt panel and bodice. A lovely geometric lattice design is at the bottom of the panel and bodice. 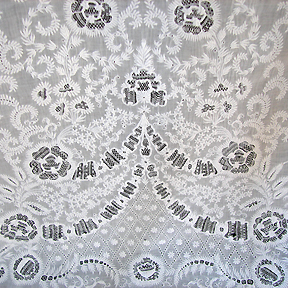 A lovely geometric lattice design is at the bottom of the panel with decorative whitework on the wings and scalloped hemline. A stunning gown! Circa mid 1800's, superb Ayrshire embroidery on this delightful gown. The bodice is encrusted heavilly with fine whitework and the unusual sleeves are also heavilly embellished. A lovely pyramid shaped design on the skirt with fine Ayrshire work on the wings and all around the edges. The Ayrshire embroidery is quite superb, a truly beautiful gown! A wonderful and very rare child's dress circa 1850-1860. A green silk pique fabric that has deep scallops on the front, sleeves, and edges of the dress. 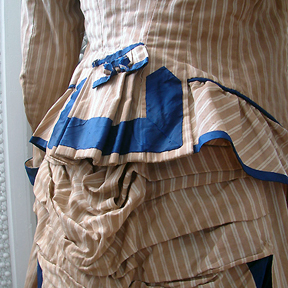 A very ornamental belt has ruching and buttons on the back, with a similar design at the front. The darker green silk trim adds a wonderful accent. Very rare! A superb item for the collector. A lovely 19th C. tan and white stripe cotton jacket with faux vest. A adorable concoction! A wonderful item for the collector. 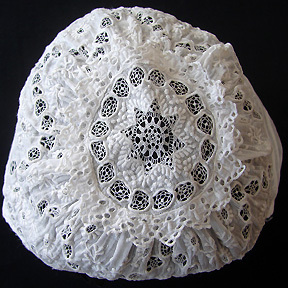 A sweet frothy Valencienne lace christening bonnet! 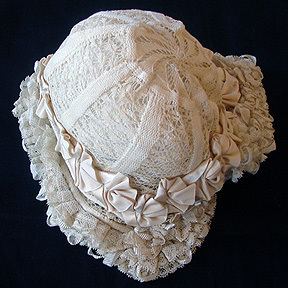 Circa 1890-1900, the bonnet has raised embroidered flowers and trim, and ruffles and Valencienne lace. 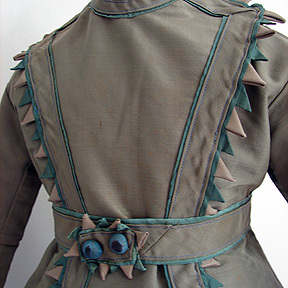 A very unusual design on this early Ayrshire gown. Superb Ayrshire work on the bodice and elaborate sleeves with two very wide embellished wings. The "Boteh" design on the gown is highly unusual. Superb rare design and embroidery. A real gem! 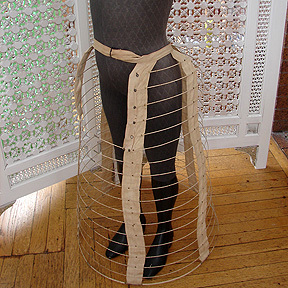 A extremely rare item to find, this young ladies bustle cage dates from the late 1800's, made with linen covered wire hoops. Measuring apprx. 28" long with a waist of apprx. 26-28". 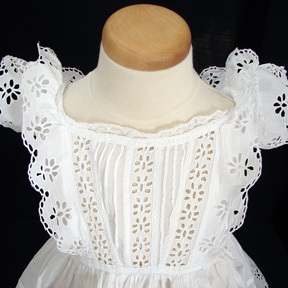 A lovely child's dress with masses of pintucking, embroidery, and Valencienne lace. An adorable French dress with a ornate tambour lace design on the skirt. A lovely concoction for baby or doll. A lovely early 1800's Christening gown with a unusual empire waistline. 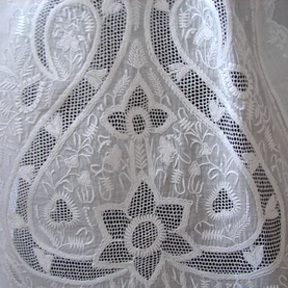 Fine whitework embroidery and drawnwork on the unusual bodice with similar whitework on the scalloped edges of the gown. The early Neo-Classical gowns emulated the fashions of the period, with refined elegance and simplicity in the designs. Probably one of the most ornate examples I have come across. The skirt is encrusted with large bold whitework scrollwork, flowers, vines, and leaves. 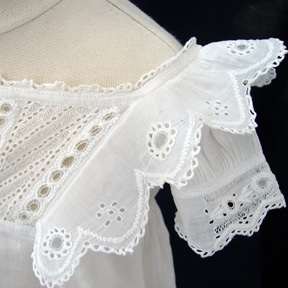 The wings are also worked and the whole scalloped hem has whitework. 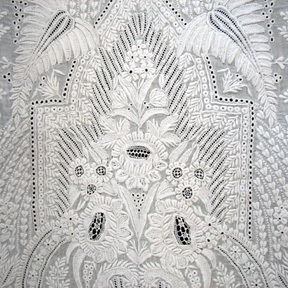 A gorgeous example of Chikan whitework. Part of a children's collection that came from a wealthy Park Avenue estate. The lady purchased all her items from places like Saks, Bonwit Teller, etc. 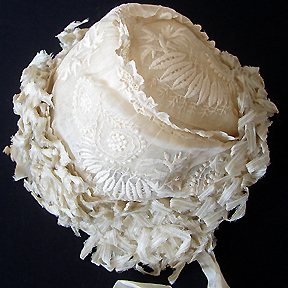 Circa early 1900's, a lovely handmade bobbin lace bonnet, which is embellished with fine silk ribbon rosettes. The bonnet is lined in the finest silk. Circa early 1800's, a very elegant Empire christening gown with a ornate bodice. Lovely fine embroidered flowers with tiny needlepoint fillings is enhanced by the fine band of drawnwork, the tiny scalloped lace on the sleeves and the wings. Part of a very important early collection of christening gowns we purchased recently. These early gowns are extremely rare to find. A lovely rare American fine knitted bonnet. The threads are fine and light and the work is enhanced by tiny three-dimensional bobbles. A lovely rare bonnet with quality workmanship. 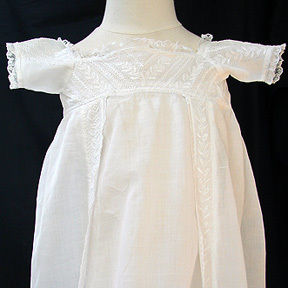 Circa late 1800's-early 1900's, a fine child's dress with pintucking and broderie anglais. Heavily worked on the bodice and sleeves and wings, with masses of pin-tucking on the skirt. Extremely pretty! 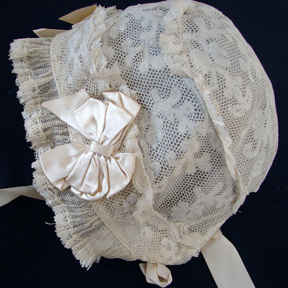 Circa 1880's, a rare Brussels Point De Gaze Christening bonnet. Point De Gaze was so prohibitive in price that it was not a item that was usually made for children's items. Fine scrollwork, florals, and leaves throughout. A lovely bonnet! A stunning child's dress with the finest and lightest lawn! 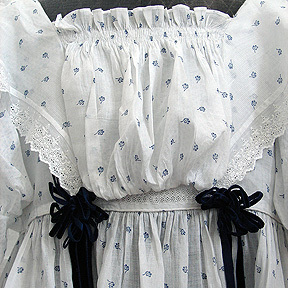 The design of tiny flower buds are delightful, with adorable puffed sleeves, lace, smocking, and blue velvet ribbons. A wonderful period child's dress! A lovely Edwardian child's dress with the traditional dropped waist. 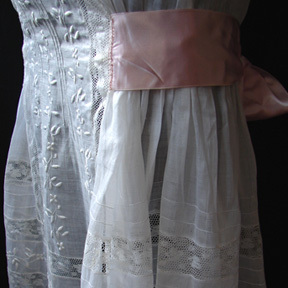 The dress is made of fine lawn and is embellished with whitework, Valencienne lace, and is enhanced by a pink satin ribbon that ties into a bow at the back. A pretty dress for the older child. 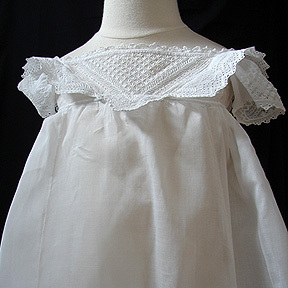 A beautiful early Christening gown with a empire waistline. The early 1800's was a time of elegance and a ethereal simplicity. 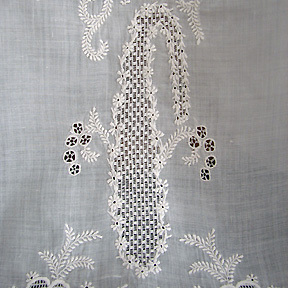 The finest whitework embroidery is worked on the bodice, sleeves, two wings, and also along the entire edge of the gown. Tiny garlands of flowers alternate with fine drawnwork, and the neckline, sleeves, and edge of the gown have fine handmade Valencienne lace. A wonderful gown! A lovely gown! Early 1800's, a fine lawn gown with a highly decorative bodice. 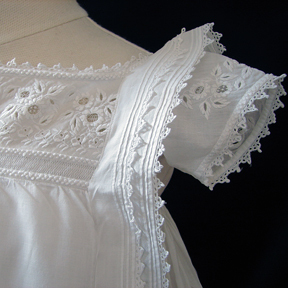 Fine drawnwork alternates with whitework embroidery and is enhanced by scalloped wings on the bodice. The edge of the gown has pintucking and a whitework flower garland. 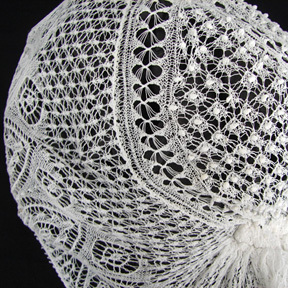 A lovely child's bonnet of Irish crochet and Valencienne lace. A fine silk lining on the inside of the bonnet, with lustrous silk bows on the sides. A pretty bonnet! It is always rare to find a bonnet of Irish crochet. A lovely early baby's cap with a lovely symmetrical design. 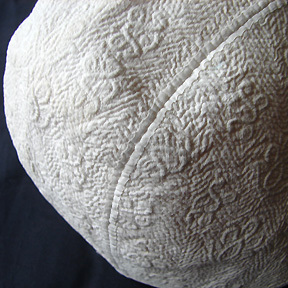 The bonnet was quilted using the corded and stuffed technique. There are flowers, scrolls, and leaves in the ornate design. 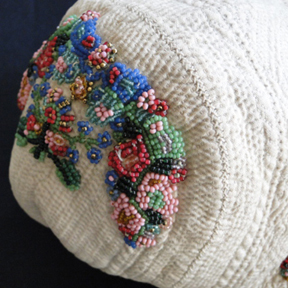 A lovely early bonnet, with a lovely design and superb workmanship. 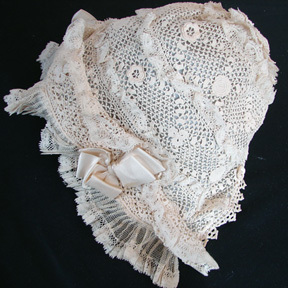 A wonderful bonnet almost entirely covered in Valencienne lace and ribbons. The ornate crown on the bonnet has two layers of lace, with masses of ribbon ruching around the edges of the bonnet. 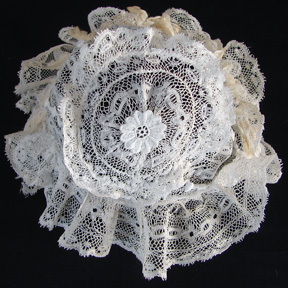 A superb 19th C. Christening bonnet with masses of Valencienne lace and ribbon rosettes. The combination is very unusual, with fine handmade knitted design surrounded by a lovely garland of ribbon rosettes. In good condition. 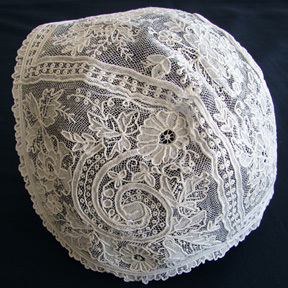 Circa 1860's, a excellent honiton lace christening bonnet with a charming design. Fine tiny flowers and meandering vines and leaves throughout the bonnet. Exquisite workmanship and design. In good condition. 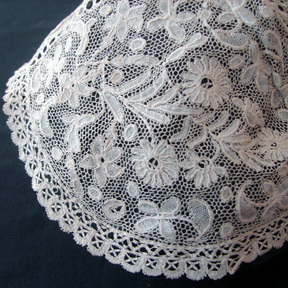 Superior design and workmanship on this charming Ayrshire whitework bonnet. A elaborate crown is further enhanced by the finest needle lace fillings, with tiny garlands of flowers interspersed with roundels filled with fine fillings. Superb quality, both in design and workmanship. IN good condition.